It seems like every cable channel out there that started out as a niche station has started to rely on reality TV which has little to do with their original concepts. The History Channel for example has shifted from Hitler to truckers and pawn shops, but there is one new show that feels like a throwback: How The States Got Their Shapes. 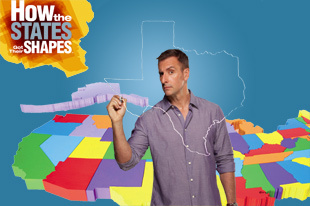 This show, hosted by Brian Unger, depicts how all of the different factors from nature to politics have shaped each state in the Union. It's an interesting, amusing, and thought provoking look at how where we live has been impacted by so many different forces, and it's become one of my favorite new shows. Maybe it's because I was a total nerd when it came to the States as a kid, but something about this show just speaks to me. Plus, watching a show with actual educational properties is a nice change of pace from my shows that focus on con-men and glee choirs. If dig history or other social sciences, or just love trivia about the States, you should check out How The States Got Their Shapes.